Heat oil in a large saucepan over medium heat. Add onion and bell pepper and saute for 2 to 3 minutes. Add the garlic and saute for 1 minute longer. Add oregano, crushed tomatoes, tomato paste and sugar. Bring to a simmer, adjust heat to low and continue to simmer for 15 minutes. In a shallow dish combine breadcrumbs (or panko breadcrumbs), Parmesan cheese, oregano, thyme, pepper and salt. In a separate shallow dish, whisk the eggs together. One at a time, dip a chicken breast into the egg, then the breadcrumb mixture turning to coat both sides and place on the paper lined baking sheet. Lightly coat chicken with cooking spray. Bake for 15 minutes. 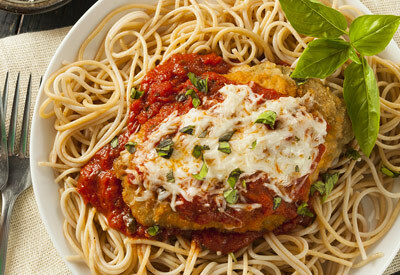 Remove chicken from the oven and spoon two tablespoons of pasta sauce and two tablespoons of mozzarella over each piece. Return to the oven and bake for 10 minutes longer until the mozzarella begins to brown. Place each piece of chicken over a bed of spaghetti and sprinkle with ribbons of fresh basil and serve with the extra pasta sauce.